into the HF transceiver from anywhere in Australia. The VKS-737 Radio Network has base stations situated in key locations around Australia, in order to maximise contact opportunities with mobiles. For ease of identification base stations are named after the nearest City or major town rather than actual location of the station. All bases are licensed by the Australian Communications and Media Authority (ACMA). 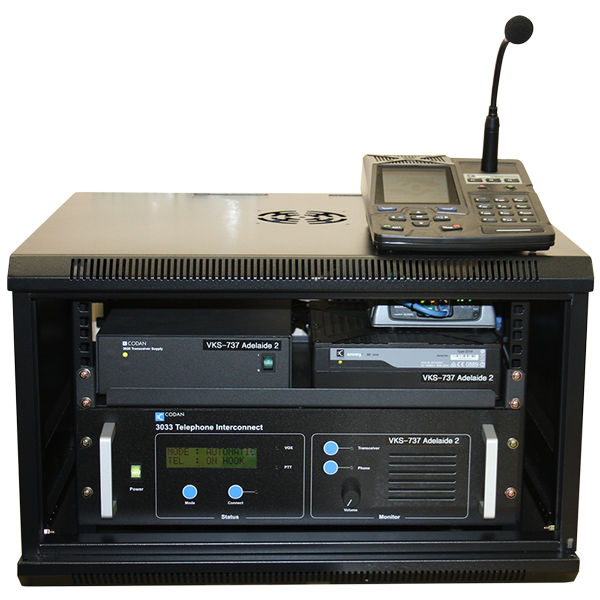 Base stations are equipped with the latest technology hardware including Codan 3033 Radio-Telephone Interconnect units and Envoy HF transceivers. Simply call in, on the allocated frequency, while the operator is on air. Check the skeds table in the VKS-737 Reference Manual, times and bases involved are all detailed, the sked list is also available within the 'Users' tab (VKS-737 subscribers only). All base stations can be SELCALLED between sked sessions if urgent contact is required by subscribers . When the selcall is made, the base interconnect unit will direct your call through to a preset telephone number - wait for the respondent to answer. If there is no answer, move to the next selcall number listed. The same situation applies for all bases. See your REFERENCE MANUAL for selcall details of the bases.